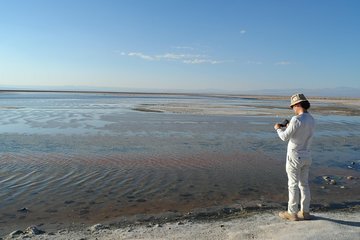 Take a half-day tour from San Pedro de Atacama to visit the salt flats and the village of Toconao. Head to the Flamencos Natural Reserve to see these vast salt flats which stretch for 100 kilometers. Then head to the Chaxa Lagoon to observe Andean and James flamingos in their natural habitat before visiting the colonial style village of Toconao, which is built from white volcanic rock.